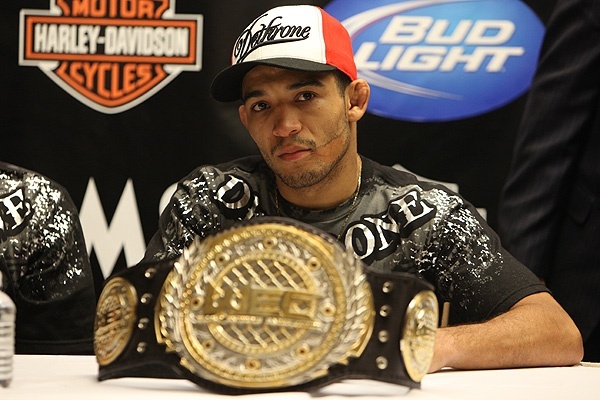 UFC featherweight champion Jose Aldo finally completed the road to recovery . His injury revented him from attending his UFC 125 fight. The Brazilian was pushed off the card due to neck injury. However, the fighter is now ready to defend his title even though his coach and manager asks him not to. Aldo proves to be hungry of the battle inside the cage. He’s more than proud to be a UFC featherweight champ. “He’s excited to get in there and fight in his first UFC match. That kid is always ready to fight. He wants to fight all the time. If he could fight four times a year, he would,” Soares commented. Aldo is supposedly fighting Josh Grispi, but the latter was tapped out by Dustin Poirier on the Jan 1 fight card. However, the cards turned to Canadian fighter Mark Hominick at UFC 129 in Hominick’s home country of Canada. Even with some issues on his health, Aldo is very determined to defend his title on the turf. “He’s back to training and he feels good right now. That little time off and physical therapy kind of straightened things out,” Soares said. The bout will co-headline the UFC 129 fight card on April 30 at the Rogers Centre in Toronto.